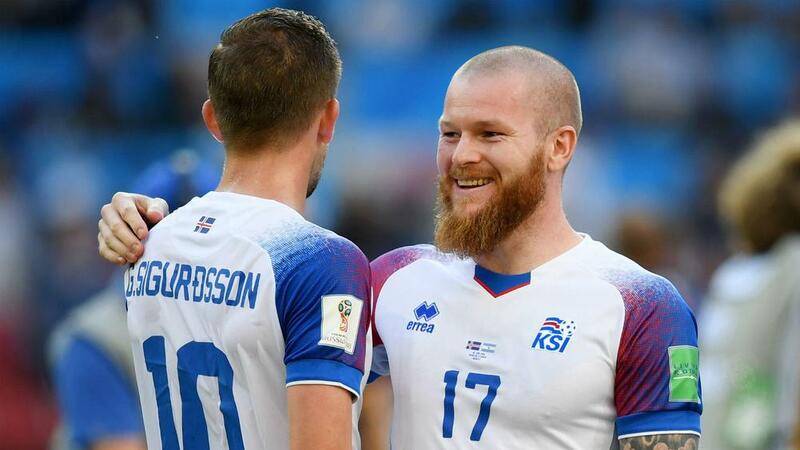 Iceland captain Aron Gunnarsson hailed the extraordinary support the team has received back home, after 99.6 per cent of the country's TV audience tuned in to watch its 1-1 draw with Argentina. Iceland proved hugely popular in its first appearance at a major tournament two years ago, drawing with Portugal and knocking England out of UEFA Euro 2016 before losing to France in the quarter-finals. After reaching the World Cup for the first time, it picked up where it left off on the big stage, by holding Jorge Sampaoli's heavyweight side to a 1-1 draw in Moscow. With a population of just 330,000, a significant proportion of the country has travelled to Russia to cheer on the team. And it seems almost all of the rest were glued to their television sets, leaving reporters to ask Gunnarsson what the tiny minority not involved in the collective experience could have been watching. "It just shows how much support we have," Gunnarsson said. "I don't know what the 0.4 per cent were doing or what they were watching, they must have fallen asleep or something. "We're definitely doing something right. People want to be involved with us. It's very important to feel that support from our people. We're not just doing it for us, we're doing it for them." Iceland's next challenge will be taking on a Nigeria side hurting from a 2-0 loss to Croatia and in desperate need of a positive result in Group D.
"Their strength is in their physique," head coach Heimir Hallgrimsson said of a squad boasting the likes of John Obi Mikel, Kelechi Iheanacho and Victor Moses. "Good athletes, all of them. A big running capability. They play direct, they're a really good counterattacking side. I have to give credit to their coach, [Gernot] Rohr. "Their organisation, you can see their improvement in tactical awareness. They have six players in the English Premier League, players in LaLiga, Serie A. "This is a massively good team with great individual strengths." Hallgrimsson confirmed Burnley winger Johann Berg Gudmundsson is unlikely to play due to a calf problem, as the coach prepares to make planned changes for a match set to be played in oppressive heat on the banks of the Volga River.